According to old tradition the twenty aspects of Tara are visualised around the main figure. According to new terma tradition the twenty-one aspects are visualised below the main Green Tara who is thus visualised twice, because Atisha added a verse, which praises the main deity. Green Tara (the main deity) and each of her 21 aspects are mentioned in the praise verse by verse. The twenty-one Taras are explained by Bokar Rinpoche and Ringu Tulku Rinpoche respectively along the verses. There are many different traditions for the visualization. I bow down to You, swaha. Of the Lotus Face of the Lord of the Three Worlds (Chenrezi). Of Autumn, laid one upon another. Of a multitude of thousands of stars. By a gold and blue lotus born from water. diligence, the difficult, peace, patience and dhyana. - Kanakavarna Tara, serdokchen gyi drolma, Golden Liberating One; golden. Ten arms symbolising the Ten Perfections. In her right hand she holds a mala (rosary), a trident, a vajra, an arrow and a sword. In her left hands she holds a silk scarf, a lasso, a lotus, a bell and a bow. - Ser-ngo sönam chukter is giving of all virtues, all positive. Giving is her main activity. Her colour is yellow and blue; greenish, and she is holding a wishfulfilling gem on top of her flower. Who have attained all paramitas without exception, utterly depend. - Ushinishavijaya Tara, tsuktor nampar gyalwai drolma, Liberating One with a Perfectly Victorious Crown Protuberance; golden. She has four arms, the right hands are holding a mala and displaying the giving mudra. In her left hands she holds a stick and a vase. - Tsuktor namgyal, tsuktor means the head mound. Golden in colour, symbol is tsebum, a life-giving vase on top of a lotus. And summon all without exception. - Humsvara-nadini Tara, hum dra drokpay drolma, Liberating One Producing the sound Hum (Hung); yellow. Two arms, with her right hand in a protecting mudra and the left in the mudra of Three Jewels, holding a lotus. - Rikchema, her colour is very dark red, almost brown. She holds a bow and arrow on top of a lotus and her activity is to summon and empower everything. She is victorious over three realms: desire realm, form realm (“direction”) and formless realm (“space”). Gandharvas and yakshas gathered before Her. - Trailokya-vijaya Tara, jikten sumlay nampar gyalway drolma, Liberating One, Victorious over the Three Worlds; red. She has four arms, right hands holding a sword and a vajra, left hands holding a rope and displaying the threatening mudra. - The usual Green Tara, called tsenden ngachi drolma, the Drolma of Sandalwood Forest. She is holding a lotus flower, sometimes a wheel on it, but usually just blue lotus or utpala flower, which is bluish. Her activity is to summon (call) and to give fearlessness. And blazes intensely with whirling blazing fire. - Vadipramardaka Tara, golwa jompay drolma, Liberating One, Victorious over Hostility; black. Wrathful with four arms, right hands holding a sword and wheel, left hands displaying the threatening mudra and holding a rope. - Zigchedma shishig serngo, red in colour, holds a dagger (phurba, kilaya) on top of a lotus. Her activity is to defeat negativity. Who slays all enemies without exception. - Vashitottamada Tara, wangchuck terway drolma, Liberating One Who Gives the Sublime Empowerment; golden. She is seated on makara (sea monster) and has four arms, right hands holding a branch of the ashoka tree and a jewel, left hands holding a vase and a lotus. - Chensi motu, black in colour, very wrathful, holding a sword. Her quality is to give the power of invincibility. Adorning the wheel of all directions without exception. - Varada Tara, chok tsolway drolma, Liberating One Who Grants the Sublime; red. She has four arms, two hands above her head in the mudra of joy, holding a vajra and bell. The other right hand is in a mudra of (?) and the other left hand is holding a branch of the ashoka tree. - Chen migyalma, it means would not get the other, the negative aspect or force to get victory. She is red in colour, very wrathful, holding a dorje. Creating more and more streams of light. - Shoka-vinodana Tara, nya-ngen selway drolma, Liberating One Who Dissipates Suffering; red. Four arms, two hands above her head in the mudra of joy (palms joined), other right hand holding a sword, other left hand holding a branch of the ashoka tree. - Jigten sumgyal, that means victory over the three worlds, she is overpowering the maras (negative forces of attachment and aversion etc.) of the world. She is red, holding a victory banner, gyaltsen. All the multitudes of Protectors of the World. With the syllable hung of the Wrathful Grimacer. - Jagadvashi Tara, drowa gukpay drolma, Liberating One, Who Gathers Beings; black. She has two arms and holds in each hand a hook (to gather beings). - Norter, it means “giving wealth”, that is her activity. She is red in colour, wrathful and holding a dorje. And all Her adornments, are shining intensely. From Amitabha in the midst of Her gathered hair. - Mangalaloka Tara, tashi nangway drolma, Liberating One with auspicious Light; golden. She has eight arms, in the right hands a vajra, trident, hook and sword. In the left hands a jewel, hook, stick and vase. - Tashi tunshik, her activity is to bring auspiciousness. She is yellow in colour and holding an endless knot, the knot of eternity. like the fire at the end of the kalpa. Totally defeats the hordes of enemies. - Paripachaka Tara, yongsu minparzepay drolma, Liberating One Who Leads to Complete Ripening; red. Four arms, in the right hands she holds a sword and arrow, in the left hands a wheel and a bow. - Dapu nyama, red in colour, vanquishes the enemies. She holds a vajra on top of a lotus and the vajra has its upper spokes open. Vanquishes all of the Seven Levels. - Bhrikuti Tara, thronyer yoway drolma, Liberating One Frowning Her Eyebrows; black. Three faces: right is white, centre black and left red. She has six arms, holding in right hands a sword, a hook, and a stick; in her left hands she holds a skullcup, a wheel and a rope. - Trho nyerchen, manifests as Bhrikuti, The Angry Grimacer. She throws the world upside down, crushes all and brings them to liberty. She is black and wrathful, holding a pestle. She who is the embodiment of the field of experience of Nirvana's Peace. Is the embodiment of the defeat of great bad karma. - Mahashanti Tara, shiwa chenmoy drolma, Liberating One with Great Peace; white. Six arms, in her right hands a mala, giving mudra and a stick, in her left hands a lotus, a vase and a cup filled with fruits. - Rabchema, very peaceful, white in colour. Her activity is to pacify all bad karma and negativities. She holds a small vase with a flat bottom. Of those with perfect joy at the complete circling. Of the arranged ten-syllable speech. - Raga-nisudana Tara, chakpa jompay drolma, Liberating One, Victorious over Attachment; orange-red. Two arms, a trident in her right hand and a tree branch in left. - Barwe orgyen, means “blazing with colour”, red. She is Buddha’s activity aspect, holding a double dorje. And all the three worlds. - Sukha-sadhana Tara, drolma dedrupma, Liberating One Accomplishing Happiness; orange. Two arms, holding a moon disc with both hands. - Pame nönma, mild orange, holding a chörten (stupa) on lotus. Pame means immeasurable and nönma means to press on, so, stamping her feet. And has the form of the Lake of the Devas. Through reciting the two taras and the syllable phat. - Viaya Tara, drolma namgyalma, Victorious Liberating One; white. Seated on a goose she has four arms, two hands above the head in the mudra of joy, holding hooks. Other right hand in a giving mudra and other left hand holding a lotus, upon which rests a text. - Magya chenmo, peaceful, white in colour, holding a moon. She eliminates all poisons, which is clearly mentioned in the text. With the majesty of Her joyous complete armour. - Dukha-dahana Tara, drolma dug-ngal selma, Liberating One Burning Suffering; white. Two arms, holding in her hands a triangle symbolizing fire. - Mipham gyalmo, she is bright white and carries a white umbrella eliminating quarrels and evil dreams. By reciting the two haras and tuttare. - Siddhi-sambhava Tara, drolma ngöndrup jungma, Liberating One Source of Accoplishments; orange. Two arms, holding in her hands a vase containing the accomplishments (supernormal powers and the realisation of the nature of the mind). - Ritöma, ritö lhamo, orange. She carries a casket (with a corpse) on top of a lotus and her activity is to eliminate diseases. Of the multitudes of avaharas, vetalas and yakshas. - Paripurana Tara, drolma yongzok jema, Liberating One Who has Achieved Perfection; white. Seated on a bull, two arms, her right hand in the mudra of protection and left holding a trident. - Özer chenma, she is reddish white and holds a golden fish on top of a lotus. Her activity is to prevent stealing and robbery and all kinds of mishaps. This morning we are going to look at the Green Tara practice. I’ll be using all my notes and whatever commentaries and teachings I’ve had in Green Tara. I don’t know if I can talk for two and half hours solidly on the benefits of Green Tara, I’ll do my best. We basically cover the practice as much as we can – not as practice instructions as such, but just generally trying to talk about Tara. The Tara practice which we do every morning in Samye Ling, comes from Tara tantra. There are various Tara tantras and there are also many different Tara practices. There are short and long practices. But all of these are part of the tantras and generally they belong to kriya yoga tantra. All tantric Buddhism is divided into four tantras: first is kriya tantra, then charya tantra, yoga tantra and anuttarayoga tantra. I think most of the visualisation practises and Vajrayana practices we do, they tend to come from the anuttarayoga tantra, generally. But this one is more connected to the kriya tantra, and it says that the kriya yoga tantra was based a lot on the daily life of the rishis and brahmins in India. It places a lot of emphasis on purity of actions, purity of daily life. Everything has to be very clean. Certain practices have that strongly emphasized. For Green Tara practice that is the reason why you are not supposed to be eating meat or drinking alcohol before you do the practice. You are supposed to have a lot of cleanliness around, when you are doing it, things have to be done very correctly. This is very strongly related to this kriya yoga tantra. Because the Tibetans eat a lot of meat, for that reason those practices were tend to be done very early in the morning, before breakfast, before you eat anything. In case you eat meat for breakfast, you do the Tara before, that’s the reason why it’s mostly done in the morning. Actually you can do Tara practice any time, all day long, you don’t have to think that Tara should only be done in the morning. But if you do Tara practice as a retreat or as long term, if you do many Tara pujas during the day, then generally you are recommended to keep these guidelines connected with the kriya yoga tantra of no meat, no alcohol, staying very clean. Like I think brahmins take showers every day, wash every day before you do practice, all that kind of thing. And it’s a very common practice, it’s done in all of the different Tibetan religious traditions. It’s not just something done only in one school or another school, it is actually practised by all of the very accepted, very… there is no monastery, no school, no place really, where the Tara practice is not done. It is probably one of the most common practices everywhere you go. For Tibetans the two practices that everybody does, whether you are in the monastery or outside the monastery, are Tara, or at least the praises to Tara, and Chenrezig, the mani-mantra and the praises to Tara, everybody knows them by heart. Everybody chants them; when you are riding on busses, around dangerous corners and bends with steep ravines, then everybody is doing their praises to Tara overcoming fear and obstacles. So it is probably one of the most common practices that you find everywhere. 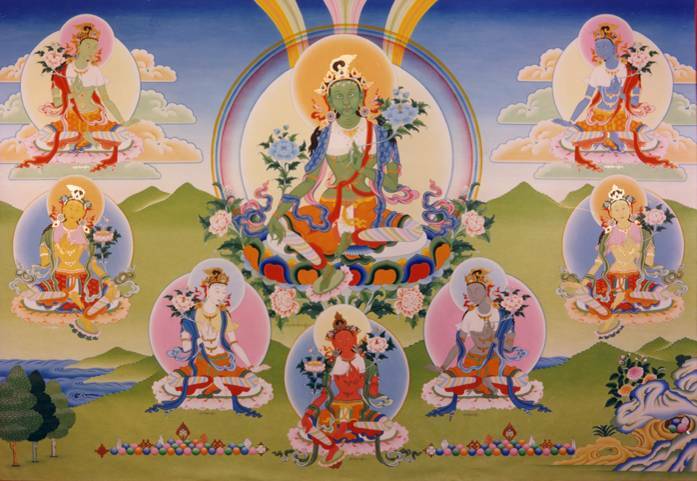 When it talks about the different stories about the origins of Tara, both Green and White Tara, the most common story is that Chenrezig made a great promise, at a certain time he made this great commitment to help and liberate all beings, and that he would only become enlightened himself, when all beings were liberated. He made this commitment to work for all beings for kalpas and kalpas and until he had liberated limitless sentient beings, he would not reach enlightenment. It says in this legend, that at certain time he was saying: “Well, now I have been practising for a really long time, it must be getting close to the end now, let’s have a look to see how many people are left out there.” So he had a look and he found that it looked just like when he started. All these beings are still there, how come, what has happened? He started getting discouraged, he started losing the strength of his commitment, it was fading a bit, there were few doubts. It is said that at that time, due to his despair, his head split into many pieces. Buddha Amitabha appeared to him and said “Try to put yourself together,” something like that, “You’ve been very childish, come’ on, you made this strong commitment, you’ve got to do better than that. You have to be more courageous, you have to be stronger in your commitment.” And it is said that Amitabha shaped all the bits and pieces of Chenrezig’s broken head into a thousand-armed Chenrezig with eleven heads. Then, out of Chenrezig’s compassion, two tears appeared and one tear became Green Tara and the other tear became White Tara, as emanations to help Chenrezig to accomplish his commitment very swiftly, very fast, basically. You generally say that Tara’s activities are connected to Chenrezig. This is a story about that. There is another legend actually, that says that Tara was a princess many millions of years ago, kalpas ago. During the time of a Buddha called Amogasiddhi there was a princess called Yeshe Dawa. She became a bodhisattva, because she had a very courageous nature, she was strong, fearless and committed and she made a commitment that from now onwards our work becoming so powerful and highly attained, that I can help hundred thousand beings every day. Her confidence was so strong that she felt she could do that much. She did not want to do just a little bit, she wanted to do really a lot, the strength of her courage was so big that she thought she can do more than normally, more than just being a nice kind lady, she can actually work very courageously and strongly and help that many beings every day. Because of this strong conviction, courage and fearlessness, she became an enlightened bodhisattva. Whatever she did, everything had a strong effect of helping and benefiting others and she attained different bhumis. When she became enlightened she dedicated all her positive actions saying whoever is connected to me in any way, may they be able to have very swift progress, may they have swift benefit, may my swift actions effect them. And also she made a commitment that she would only be reborn in a form of a female, which is the unusual part of Tara. Everywhere you read about Tara it says she made this commitment to be reborn as a woman, even though she was encouraged to be born as a man but she said no, she wanted to have this form as a woman, appear in a form of a female and have this activity of very swift action to help beings. These are the characteristics of Tara. You could say the Tara activity. Whether we think of Tara as a female, as this princess legend, or whether we think of Tara as an emanation of all the buddhas and bodhisattvas, the essence of it, the principle of Tara is this fearlessness and courage. So anybody who approaches their spiritual path with the Tara principle, whoever we are, if we approach our practice with that atmosphere, with that principle of wanting to become Tara, because we have the potential, because we have the buddha nature, this is the way we enter the mandala of Tara’s activity. If our inspiration, commitment and courage are very strong, if we are focusing our attention wholeheartedly on this kind of action, then we become that type of being, gradually we increase those qualities. Normally we are used to thinking maybe in negative terms, we are used to develop certain negative habits. So through dharma practice we are changing through habituating ourselves in a certain way; we develop specific characteristics. If we think negatively about ourselves every day, gradually, gradually we become more negative, gradually, gradually those qualities become stronger and stronger. Because we are so focused, so fixated on those qualities. If we say: “Oh, I am a very fearful person, and we react on that all the time, we become more and more fearful, we become more and more cautious, more and more overwhelmed by the idea of being fearful. Whereas if we do the opposite: if we focus more and more on the positive qualities and on our potential, on what we would like to develop, what we admire, within this mandala of Tara, within this principle of Tara. If we focus more and more on developing that, we will become that due to this potential for change. We are not fixed. There is nothing fixed there, we have the potential to change, so naturally through focusing on that gradually, gradually those qualities start to arise in us. It’s like if we admired somebody very much, even on very ordinary levels we could say, somebody admires a film star, they start to dress the way the film star dresses, they start to have the haircut the same way, they start to walk in that same way; we could say it’s a bit like that. In an artificial, partly artificial way, we try to become like Tara. In the beginning it feels artificial, when we try to think of ourselves as a deity. We have to start somewhere, but the idea is that we try to identify more and more with those qualities, rather than with our habitual negative qualities. So when we practise Tara, it’s like we are joining the mandala of Tara, we are contributing to that mandala by becoming part of it, we are making that connection, we are becoming part of the energy of Tara. So the energy of Tara is the idea of swift activity, fearlessness, which is really a quality of the enlightened mind. One of the qualities of Buddhahood is said to be total elimination of fear. Through total clarity, awareness and presence there can’t be any fear. The clarity is like the sun that dispels all the darkness or doubts of fear. The fear is only able to be there when there is lack of clarity. The fear is like a little doubting voice at the back of our heads saying: “Maybe this, maybe that or maybe not.” It’s like conceptualizing; having worries and doubts and ideas about what might happen. Trying to protect ourselves, trying to protect the ego. So, when that presence and clarity is there, this is totally dispelled. We can see ourselves, if we can have even in a simple level a good meditation one day, when we feel very clear, then those feelings are dispelled naturally. It is said the Tara practice is like the sun, it simply shines naturally; the activity of an enlightened being is there naturally, when all of the clouds are dispelled. So it says we should try and create the right circumstances for the action to be there. We should try to have confidence in the presence of Tara. In a way the confidence in the presence of Tara means also confidence on buddha nature, confidence in our own potential. There are three main causes for the presence of Tara, the enlightened mandala or the activity, and if we feel the presence of Tara, it is because these causes are there, the causes are accomplished. First, there is no limitations to the nature of beings, there are no restrictions; time or space do not give any limitations. And then it says that… in a way this talks about the activity of both of the enlightened mind and us as students, so it says for an enlightened being there is no limitations. Just like the way the sun can appear, the sun appears whether there are clouds or not, the sun is there shining. And the next condition is compassion. The compassion of enlightened beings is spontaneous and also they made the prayer of aspiration, that it is available to anybody who has the purity, who has the right attitude, right outlook. So aspiration of the enlightened beings is due to their compassion to help all beings. And then the condition is also, that we have the openness of mind, that we develop a pure outlook partly through devotion. When these conditions come together, then everything will happen, whether we want it or not. When right things come together, things will grow, arise out of it. Just like when a bulb is put in the ground, the right conditions are there and then the bulb starts to grow. So, devotion is said to be extremely important. I mentioned it, when talking about the ngöndro, but it says that in fact we could think of Tara as a Guru Yoga, and we could relate to it just like a Guru Yoga. Devotion is so important, because it opens us up, it makes the person pure. It is a very strong and important emotion for opening us up to the receiving the blessings. Devotion is not a feeling that has clinging or attachment, grasping to it, it doesn’t have aversion. It just opens us up as a vessel, very natural, very vivid feeling. It opens us up without any exclusiveness. Not holding on, not closing up, it’s not dull, it’s not clinging. When we have the devotion, it’s easier to cultivate the Vajrayana tradition and within this tradition devotion is very deliberately cultivated, very strongly, because it is devotion that creates the right environment for the qualities to arise in our practice. All of us have devotion or grief to something or for someone. It’s not like if devotion was totally alien to us, but when we are doing these practices, we are directly relating them to the lineage, to the Guru, out of appreciation, out of trust we try to focus on it, we try to address prayers, even though in one way there is nobody out there to pray to, but still we are directly reciting all the devotional prayers and the aspirational prayers. Through devotion we try to relate to Tara as an enlightened being, as the essence of all the buddhas and bodhisattvas together; the wisdom of all the buddhas and bodhisattvas has come together in one. And we try to identify with that in the same way as we would, if we wanted to become a doctor or a lawyer, certain qualities and ideas that we identify with, those areas of activity. You could say even a soldier. It’s a very strong example, because soldier has a very strong discipline, there is a very strong image. Hopefully nobody here wants to be a soldier, but the idea of a soldier brings up a very strong image. We know that if we are going to be a soldier we have to act in a certain way, dress and walk in a certain way, our mental attitude has to be in a certain way, so with that in mind, with the Tara practice, we think and we try to take on this principle of Tara, the qualities of Tara. Understanding in a way that there is no difference between us and Tara, but that we have to train in this becoming like that, becoming like Tara through the practice. This text is a terma. It was found by Chögyur Lingpa. It is said that there were 108 individuals who were said to be great tertons (terchen), and Chögyur Lingpa was one of them and he discovered this practice. It’s called a gomter, mind terma, it is said that it appeared when he was staying in a cave called Pema Shelphuk, the Crystal Cave of Pema, and he had a vision of Tara, and Tara said to him: “Lekso, lekso, lekso.” Three times she uttered this, which means “very good, excellent, very good.” He had this vision of her saying that, and then in his mind appeared this terma, which he passed on to Jamgon Kongtrul, who then formed it, he wrote the actual sadhana. There are many different types of termas. You have termas that are taken out of rocks, out of water. There are many stories how it happened, because often Chögyur Lingpa actually would retreat the termas in front of a big crowd, I think to give people confidence that this was a true genuine terma. At a certain time, when he knew that he had an urge to go in a certain place, and somehow he must have known this was now the time to reveal a terma, he would call people together. Lots of local people would come around and witness him pulling out these termas directly from rocks or from caves. Especially at that time, the 19th century Tibet, Chögyur Lingpa around the time of Jamgon Kongtrul the Great, and also Tense Rinpoche, there were many termas discovered. This comes from the nyingma order; most of these termas were buried by Guru Rinpoche in many different places together with Yeshe Tsogyal and Mandarava. And also he [Chögyur Lingpa] found at the same time, when this text, this terma appeared to him, an image of Tara was brought out together with it. An image of Tara, and apparently that is the Tara statue that is now in Rumtek, and it’s said to have spoken at various occasions. It is said to have actually uttered sounds. In general with all of the teachings there are two traditions. One is the terma tradition, one is the kama tradition of the regular texts or teachings. The kama tradition is all the traditions from the Buddha’s time taught in India, taught in Tibet, translated and now contained in the Kangyur and Tengyur. Kangyur is all the teachings of the Buddha and Tengyur is all the commentaries. And the terma tradition is the transmission that comes through Guru Rinpoche with all these treasures that have been buried. So the treasures, the terma treasures are said to be very relevant, especially because they are meant to be discovered by particular tertons and they are meant to be drawn out at certain times, when these teachings are especially beneficial. When a terma is brought out, it has stronger benefit, because it was meant for that particular time and for those particular people. This is a very new terma, if you think of it, the 19th century is not very long ago. So it’s said that the saters… saters are the treasures that are buried in the ground. People go into particular place and dig it out or unearth it, take it out of rock. It is said that the rock becomes soft like butter for the particular terton and he can just put his hand in to the rock and just pull it out. And sometimes the thing that is retreated can be a text, it can be a scroll, it can be an object like what [Akong] Rinpoche used for the Guru Rinpoche empowerment, the Guru Rinpoche’s statue that was a terma, and the phurba. Sometimes it is just a few words in a dakini script on a yellow piece of paper, yellow scroll, sometimes it’s robes: Guru Rinpoche’s robes, Yeshe Tsogyal’s or Madarava’s robes as well as relics. And then, like here sometimes, it’s what you call a mind terma. It appears spontaneously to the terton. Sometimes you have stories about the terton: he faints. It is not sure if he is fainting or if he has a vision, but to people it appears as he fainted, and then he comes to. Within that state he has visions, images or memories that arise from the time – all of these 108 tertons, they were the main students of Guru Rinpoche at the time of Guru Rinpoche, so it is like a memory coming back of those teachings that they had from Guru Rinpoche at his time. Sometimes it is visions of dakinis appearing and giving the teachings, whether it is in a dream state or broad daylight. That’s about the origin of the text that we have used. When you read the text, if you read it in Tibetan you can always tell if it is a terma, from the way it’s written. After each of the slokas, instead of a stroke there is a dot and a little stroke and a dot. This is actually a sign that it is a terma. The Green Tara practice, you are all familiar with it here. The way it is practised is either a puja, the way we do it in the morning, or you can recite the Green Tara praises just as they are. Or it is also called a dokpa, if you recite it like that. We did that in the retreat every day; we would recite the 21 praises as part of a whole series of dokpas. Dokpa means to turn away. It literally means turning away, turning away obstacles and for example with long Mahakala you have long series of dokpas that you recite. So when you recite Tara praises alone, you relate to them as a dokpa, averting obstacles. You can simply recite them like that, you don’t have to recite the whole puja. And praises to Tara are what they say: they are simply praises to 21 aspects to Tara. I have to admit to you that I have not been completely sure how to go through these praises, how to go through the benefits now this morning. How shall I approach it? It’s not so easy just to talk about benefits of Tara. We can look at the 21 Praises, it might be useful to look just briefly, because this is actually the main part of the practice. In most of our practices it’s the mantra, the mantra recitation, but here in the Tara puja, if you have noticed, there is just a very short time for the mantra and really you are meant to recite the praises; first two times, then three times and then seven times. They are long, so long time is spent on reciting the praises and with that in mind, while you recite the praises you are meant to visualise Tara and you also visualise that you are receiving the qualities from Tara. As a part of it you are imagining that from Tara’s white toe amrita (it is sort of similar to Dorje Sempa, but it is not a purification, it’s enriching) you are imagining that from Tara’s toe amrita flows down, enters the crown of your head and fills you up and enriches you with all of the qualities of Tara. While you recite the praises you think of that. There are three places where you recite the praises. First time you think Tara’s posture is in a bestowing posture, her mudra is with the right hand up bestowing the qualities, and the second time in the text you think her hand is turned around and is holding the protecting mudra, and you should imagine that just above you and all beings there is a hand of Tara almost radiating light and giving protection. The third time you think that all the amrita is flowing from Tara’s right toe and filling you up. It fills you up totally and enriches you completely with the qualities of Tara. So it’s not like in Dorje Sempa, where you feel all the negativities are leaving you, it’s more that you are just being enriched continuously with qualities of Tara. The 21 Praises are homage to Tara. And the very first verse is not counted as one of the praises, so if you are doing just the praises, that’s normally left out; if you are doing it as a dokpa, you leave out the very first verse. In here it says the whole first verse has been added by the translator. When you look at the praises it says: “Homage to Tara whose face is like one hundred full autumn moons blazing with light like thousand stars.” So it’s praising Tara as the autumn moon. It says like the image of the moon is very cooling, pleasing light, it says Tara’s face is even brighter than a hundred autumn moons, all blazing at one time, luminous, radiating light, and thousands of stars glittering on their own. So, basically praising the radiance of Tara’s appearance, very lustrous. And the next verse says she is adorned by golden blue lotuses, she enacts generosity, tranquillity, patience and meditative stability. It means we are paying homage to all these qualities of Tara. Here we are paying homage to Tara as the embodiment of Six Perfections. The Six Perfections are generosity, moral discipline, patience, diligence, meditation and wisdom. We say she is embodying all of these qualities. It also pays homage to Tara as the one who has the Buddha Vairocana above her head. It’s said that Vairocana uttered these praises to Tara, in fact it is said that they appeared out of the crown protuberance. The Buddha Vairocana has this extra crown chakra and it is said that it actually was uttered by the crown chakra of Vairocana. It pays homage to Tara who fulfils all the wishes and who trembles all the worlds under her foot, who summons everyone without exception. It says with the sound of the mantra tuttare – the sound fills all the worlds and as she fills all the realms of desire, she fills all the space, the form and formless realms, all the universal space with the sound of her mantra, fulfilling the wishes of beings. It is said that she tramps with her foot all the obstacles within the three worlds. It says: ”Homage to her to whom all the gods…” they present her with offerings. Tara is referred to somebody who is paid homage to by all the gods like Indra, Brahma, Agni, all the Hindu gods, all the rishis, Rudra, all of the bön gods. All the different gods are mentioned, all the rulers of the universe are mentioned as making offerings to Tara. She is praised by all the spirits, and through the power of her mantra all actions will be accomplished, all direct actions will be accomplished in overcoming harm, controlling obstacle makers, benefiting beings, taming those who need to be tamed. Whether she needs to play wrathful or peaceful form, all of them subdue the various obstacles. Pacifying illnesses, epidemics, diseases, she scatters all the demons and bestows blessings, protection for all beings. So, I don’t know if this is very useful for you to go through. All of the praises are description of the different 21 Taras and referring to them in a way, like you have the translation of the actual verse and then there is little bit of explanation. There is really not a lot of direct explanation of how do we relate this to our everyday life. How do we relate this to overcoming our own fears hear and now, which is in a way, what we want to know. But in general when you talk about the eight fears, I think in the text it is related to different animals, but it is also related to our own emotions. In a way all the things that we need to deal with, it is not as if they were different from Tara, it is not as if they were from all the other practices we do. We still have to deal with our negative emotions, such as anger, desire, jealousy, pride, ignorance. It is not as if for Tara that had all changed. Then on top of that it talks about doubt, but really, fear is part of ignorance. When we talk about fearlessness, fearlessness arises out of developing this clarity and totally overcoming and transforming ignorance into this knowing the nature of everything, knowing the nature of our own mind. So, fear and fearlessness are part of these five emotions and when we talk about Tara it’s the idea of taking on this activity of overcoming our negative emotions. Fearlessly approaching our own neuroses, our own difficulties, and dealing with them directly through various practices. So by doing the Tara practice gradually, gradually we try to identify more and more with this approach. We praise Tara for all the qualities that Tara possesses, having this ability to act very swiftly and accomplish without any doubt the benefit of beings and overcoming obstacles. So when we do the practice, when we recite through all these praises, it is not so much as if our attention was on the meaning of the different praises. It’s more on visualising Tara above us and then all of these qualities of Tara entering us through the amrita that is flowing down through her right toe, or, when we are visualising her hand upside down and we think light is radiating, protective light, we are being protected by Tara. So it’s not that we need to know all these different aspects of Tara while we are reciting it. What we need to remember while we do the practice, is the whole aspect of what we call kyerim (development phase) and dzogrim (completion phase). All our Vajrayana practices have these two phases: development and completion phase. Development phase is when we visualise ourselves as the deity, gradually, it can be in different ways depending on which practice it is, maybe the deity appears first as a syllable, then out of that syllable we appear as a deity, out of voidness we appear as a deity. And then we describe all the qualities of the deity and we try to identify with that. That’s the aspect of kyerim, which we do in all of the Vajrayana practices, just like we do here in the Tara practice. So it’s said that it’s very important for us to identify with the pure aspects of our being rather than the impure, and that the development phase, kyerim is what helps us to identify with Tara, Chenrezig, Dorje Sempa etc. by visualising ourselves as a deity or visualising the deity above our head, depending on the practice, it will have different instructions. And we think often, like here at least with Tara, we think that our body becomes the body of the deity, our speech becomes the sound of the mantra, our mind becomes the five wisdoms or the pure mind of the deity. When our body becomes the body of the deity, we think it is like appearance and emptiness inseparable. So we don’t identify so much with the very solid body. We also don’t have great attachment, great aversion. So it is a way of relinquishing attachment and aversion. With speech, when we say the mantra, our speech becomes a sound of the mantra. We say this is the inseparability of sound and emptiness. So that doesn’t necessarily mean we hear everything as a sound of the mantra or we hear everything as “om tare tuttare ture soha” or “om mani peme hung”. When somebody asks you for a cup of tea it doesn’t sound like “om tare tuttare ture soha” or if somebody shouts at you, or compliments you, it doesn’t sound like that. But the idea is that when we try to hear all sounds as the sound of the mantra, we try to recognize all sounds as sound and emptiness inseparable. So that if somebody does shout at you, then if you can hear or remember that as sound and emptiness, maybe we don’t get so upset. Maybe we don’t get so affected by it. We think: well, this is just sound, sound of the mantra, really. Never mind what they say about us, never mind whether they shout at us, never mind about insult. It’s sound and emptiness together. It’s us who give a lot of qualities or value, judgement to it. And when it says mind, our thoughts, we will relate to mental activity as the five wisdoms. Whatever appears, whatever arises in our mind is intelligence and emptiness inseparable. The activity of the five wisdoms, intelligence and emptiness together, so that if we can remember that, maybe we don’t get so caught up in our thoughts and memories, our ideas thinking everything is so solid. All of this has very much to do with seeing how insubstantial everything is. Our problems usually arise because everything is so solid and so real. When somebody says something to us, it is very solid and real, we can carry it for years and years. We can be very up and very down depending on what we hear, what we see. Whatever we see, we attach so much importance to it, we have a lot of grasping or aversion, and due to that we have a lot of suffering. With our mind whatever our ideas are, we become very stuck as well, we become very fixated on ideas. So instead of that we try to relate them with this emptiness or voidness aspect of the deity. Actually it is said, if we can maintain these three, then we are keeping our samaya as vajrayana practitioners. To remember that ourselves and that of others’ – the body is the body of the deity, the speech is the mantra, the mind is the five wisdoms. That alone covers all our commitments of samaya as vajrayana practitioners. When we regard everything as ordinary, it is not as if we were trying – this is actually a false perception – it is not as if we were trying to create something that is artificial. It’s actually seeing things as they are, seeing things as sacred, the way they truly are. But because we have obscured them through our impure perception, through like all of the layers that are covering, our concepts are covering, we don’t have a clear view, so now we are trying to identify what is truly there. So the benefits of the kyerim and dzogrim are in this way, it covers our samaya and also develops our shine. Shine is very much part of all of our Vajrayana practices, shine means we develop a sharp mind, more clarity, gradually we become able to focus our mind. It is also said that the different stages of the development stage, the kyerim, is related to different stages of the bardo. So that it helps to purify different phases in the bardo and for our next rebirth. The different phases, when you are visualising a seed syllable, and the deity appears from a seed syllable or you yourself appear from a seed syllable, or when you visualise the lotus seat of the deity, the moon, the palace etc, the shape of the deity. All of these aspects are related to different phases of the bardo and are said to help to purify, when the lights are radiating out etc. So the kyerim purifies tendencies to see everything as ordinary. Instead we will relate to others as buddhas, we relate to the voidness aspect. And also it purifies the tendency to be reborn simply being pushed by karma. Instead we develop this strong identity relating with the deity and its various aspects. It helps us also at the moment of death. If we are familiar with visualising ourselves as the deity, this will help us not to panic, not to be afraid. We can identify with the deity at the time of death and then it helps us to develop the qualities of the deity. Then when you have the dzogrim aspect, it’s said that this is the wisdom aspect, it is translated as the completion phase. There is only a very short part of that in these practices, when the deity dissolves and you are meant to rest in that state of dissolution for a short period. It’s said we should rest in the state of clarity and voidness. Really one is meant to rest in the natural state of the mind, and because we are not able to do that really very clearly or very long, even we are attempting to do it, it’s good we are trying to do it but we are not very capable of maintaining it. So just for few moments we try to rest in that state of no thoughts, and it says: whenever thoughts start to manifest, we start to get busy or our mind starts to bet busy again, that’s when one continues chanting or whatever comes, after the dissolution you have the dedication prayers. And when we are visualising it is said, we should try to have the clarity, develop clarity, also the purity in a sense that we are aware of the qualities of the deity and we should try to have the pride of being the deity. It’s called vajra pride. These are the three aspects related to visualisation. The vajra pride means that we try to really have the confidence of thinking “I am Tara, I have the qualities of Tara.” These three things are always recommended, and our visualisation should be not solid, but more like a rainbow; appearing clearly like a rainbow but empty, not solid. Do you have any questions about this? Question: Would you explain the visualisation of Tara during the praises? Lama Zangmo: First time when you do the praises, you visualise Tara with her hand in a mudra of bestowal. Her hand is on her right knee with her palm upwards, bestowal of qualities. The second time the hand is turned over, still on her knee with the palm down and it is in the protection mudra. There you imagine that the palm is radiating light of protection and you can think of it above yourself and all beings, she is holding her palm in the protection mudra. The third time it doesn’t mention her mudra, it just mentions that from her right toe wisdom amrita flows, it enters you from the crown of the head and fills you up and you feel that it enriches you with all the qualities of Tara. You are really meant to focus on that when you recite the praises. So it’s not so much about thinking about each Tara, I’m not so sure that it’s really very useful for me to go through the 21 Taras. You can just read it. Q: Where you start the praises? L.Z. : First time: “Om jet-sun-ma pa-ma drol-ma la cha-tsal-lo…” then you go “cha-tsal ta-re nyur-ma pa-mo”. If you recite the praises just by themselves, you recite the first line: “Om jet-sun-ma pa-ma drol-ma la cha-tsal-lo…” and then you skip the first verse and then you go to “cha-tsal drol-ma nyur-ma pa-mo”. You actually skip the first verse; it’s not part of the 21 Praises. When you do the puja, you recite the whole thing. Just when it is recited as a dokpa it’s left out. Q: You said that the actual practice is more concentration on the praises rather than the mantra recitation? L.Z. : But the mantra is actually woven into the praises as well. I think in the next session we look a bit more of the practice, yes, you definitely recite the mantra as well. Q: How long you would do the mantra? L.Z. : There is no specific, whatever time you have. There is a specific number for the praises. In the text it tells you: two times, three times and seven times, but I think often it’s done one, two and three times, because it takes long time. You can do the mantra for one mala or three malas, but it depends on time more than anything else. Q: Would you do puja in the morning and praises at night? L.Z. : This is also a matter of what people can manage. It depends on how you do it, what is beneficial and what is better. It’s not that it is not good enough to do the praises, that is also good. You could do the praises, you could do some of the mantras, I mean that is fine, it’s fine to do just the praises of Tara, they are officially done like that, on their own. So, for each one of you it’s more a matter that you need to look at how much time you have at home, when you leave from here to do practice, can you actually manage to do Tara practice daily, it’s a sort of situation where you have to adjust. If you can do Tara puja, it’s very good to do it, but it’s also a lot of recitation, if you are new to it. Q: What are the three Thatnesses in the last verse of the praises? L.Z. : Three aspects of the nature of things or absolute truth. They are emptiness, absence of inherent characteristics and freedom from attachment, this is what is referred to as the three-fold Thatness. Q: Would we visualise what we recite while doing the praises? L.Z. : You would visualise Tara above. I think after the break I go through a little bit how to meditate on Tara. Q: Was Tara not much practised before 19th century? L.Z. : Yes, but it’s just this particular text that we are using [which was found then]. No, it has been practiced all throughout, actually. Q: Would you say more about why has Tara been becoming more important recently? Why is it encouraged more now in all the centres? L.Z. : As far as I’m aware Tara has always been important. But I know at certain times, if there are difficult times happening or obstacles, often we are asked to do the Tara puja. I remember once Akong Rinpoche asked all the centres to do Green Tara puja, because there were certain difficulties. I think it has always been very important, the way you look back, when you read about the history of Tara, it has always been practiced a lot, like it says in all the different monasteries it’s one of the most common and most available practices. I think nowadays, this terma not being very old, couple of hundred of years, it is not seen as being very old for a terma, maybe it means that it’s needed at this time, but it also gives people faith. I think part of the thing with the termas is, when something is new and fresh there is a strong connection with it. I think a lot of people know about this, in Nepal there is this self-arising Tara that has been appearing, maybe last 30 – 40 years it has been appearing on a rock, even less than that. I remember reading someone like Bardo Tulku, he was visiting this place in Nepal, very near of a Guru Rinpoche cave outside Katmandu. And in the seventies there was no Tara there. Then gradually, gradually Tara has started emerging from the rock. Very, very gradually it has been becoming more and more clear. And now there is just perfectly clear Tara there. And nobody knows how this has come, it’s one of these miracles that do happen: self-arisen Tara. So the activity is there, maybe it’s some form of terma or form of activity of Guru Rinpoche, from his staying in that place in his time, or the activity of Tara showing us that it works. It actually works, helping us to have faith in Tara. All these miracles are there, I think, to give us faith. And maybe also that certain times there are more difficulties, but in a way, I think there has always been difficulties, Tara’s activity must always have been necessary, throughout the times. So, even if we think this is a difficult age, I think there have always been problems in different parts of the world; there have been wars, countries conquering other countries and they all need help. I think Tara is just continuously appearing. L.Z. : The praises? I think the way it has been accepted to do it now is one, two and three times, even though in the text it is said it’s recommended they are done two, three and seven times. This is really only because of the language, here and in many centres people are not used to do it very fast, so it’s done one two and three times. Two, three and seven times is the way it should be done. In general it’s done almost like doing a mantra, it’s recited very fast. You can do one, two and three times. If you are doing it as a session, then you can do two, three and seven times. If you are doing it like the Tibetans are doing it; they recite it just any time, like I was saying, if you are on the fields or in a car or in a bus, you don’t have to count then how many times you are doing it. It’s just on your tongue automatically. On the other hand, if you are in a formal session, there are certain directions important to follow. Q: At the beginning you were talking about creating an enlightened mandala. I don’t understand what that means. L.Z. : Mandala means the area of activity. You could say for example the mandala of Akong Rinpoche and Lama Yeshe together here would be all of the Samye Ling and Samye Dzongs. You could talk about that as a mandala. But then you talk about it also in a form of a deity, from pure point of view we talk about everything becoming the mandala of the deity, and that has to do with identifying with the purity aspect, rather than the impure aspect. At that point one simply forgets about ordinary appearances and thinks everything dissolves into voidness. From that one reappears or the deity reappears, all beings become the deity, the place one is in, becomes the palace of the deity, all the sound becomes the sound of the mantra. That is in a way what you call the mandala. Sometimes in practice you have very clear descriptions about that, what it looks like, what the palace looks like and all of that. Sometimes you don’t have very detailed description and it is just, you could say a feeling, one can have a feeling of that. But really in essence it relates to identifying with purity rather than neurosis. For the last part of the session we look more how to actually do the practice, because if you are not familiar with how to do the practice, there won’t be very much benefit… So we better make sure you are clear about how to do the practice, not in great detail but in general overview. So if you are going in the Tara puja here in the morning, you will have partly a sense of how you should practice, without necessarily all the details. The practice starts as always with refuge and bodhicitta. This is in all of your Vajrayana practices. During the refuge you can imagine Tara in front of you and you think you take refuge in Tara as a representation of Three Jewels and Three Roots. You don’t have to think of the whole refuge tree, but you just think Tara in front. Best is, whenever you do a practice like this, you have a picture, a small picture in front of you, so you know what Tara looks like. It’s easier for the visualisation. So we visualise Tara in front of us in space and we take refuge and then we develop bodhicitta, we want to achieve enlightenment for the benefit of all beings. After that there is a seven-branch prayer. The seven-branch prayers are part of many practices. The seven branches are always the same, but there are long and short seven-branch prayers. They are always to gather accumulations. If you remember we talked about the five paths, so we are at the path of accumulation. That means we want to spend as much time and as much focus and energy as we can on gathering the accumulations. That means we want to focus on making offerings, focus on all the different branches of the seven-branch prayer both in our practice and in general life, in our activities. The seven branches are also said to reduce our negative emotions. They are a practice or an exercise that helps us to reduce our negativities. First of the branches is to pay homage and make prostrations. We are imagining we are paying homage and making prostrations to Tara. This counteracts pride. The second branch is: we make imaginary offerings, and this counteracts greed and selfishness. Then we have regret. We are regretting any mistakes or negative actions. This reduces aversion and anger. Then we are rejoicing all the good actions we have done and all others have done, this reduces the power of jealousy. We request the wheel of dharma to be turned, that counteracts ignorance, and then we request Tara and her 21 aspects, all the buddhas and bodhisattvas to always stay, be present and act for the benefit of all beings. And this is a remedy for wrong views. It’s like overcoming ignorance. The last part is dedication, and in a way the dedication is also part of generosity, counteracting greed and selfishness, so when we are dedicating we are giving. So there is the seven-branch prayer there. Throughout Tara puja you will have sections of offerings, sections of praise, offerings and praises. There are a lot of offerings being made, again as part of this idea of accumulating merit. There are several places where you are offering the eight offerings, and there are several places where you are offering a mandala offering. Here, whenever there are offerings, we basically think we are making mental offerings to Tara and all the buddhas and bodhisattvas as a way of overcoming our attachment. The eight offerings are the drinking water, washing water, flowers, incense, lights, perfume, food and music. These are the offerings that you see often on the shrines: offering bowls with all the flowers etc. These are the symbolic offerings that are offered and obviously it is not as if the Buddha had told us he needs offerings but they are for us to overcome our attachment and to generate generosity. But it also symbolises, for example the drinking water, the fact that we are offering drinking water is a symbol or request that all beings will quench the thirst for the dharma, satisfy all their needs for the dharma. So in a way the offerings can also be interpreted as a symbolic offering. When there is the water for bathing, it represents the removal of impurities of the defilements. Not just bathing the body of the buddhas, but it represents the removal the impurities of defilements of our mind. Offering of flowers is the beauty and richness of the dharma. The incense, generally it’s said it represents the pure fragrance of right conduct, and the light represents clearing away the darkness of ignorance. Lights clear away the darkness of ignorance. In that way we can think however you want to, however you feel you can relate to the offerings. You think of them in that way, but throughout the practice there are a lot of offerings. There is a mandala offering, where you think you offer the whole universe; everything that the universe contains is within that offering. In general there are four sections of offerings and four sections of praise. Before we do the praises to Tara there are the eight offerings and the mandala offering. Q: What do the rest of the eight offerings represent? L.Z. : The perfume water represents the development of our own purity, becoming free from mistakes, the food is the food, nourishment of dharma, and music is the sound of dharma. It all relates the dharma teachings. Then we also think that we ourselves become Tara. This is a meditation where you have both what is called the self visualisation and the front visualisation. It says that instantaneously we become Tara and we don’t think of a body like flesh and blood, we think it as an appearance like a rainbow, appearing but empty, transparent. And we think in our heart is a green letter tam (drawing on the left). Tam is the seed syllable of Tara. It’s a Tibetan syllable; if you are not aware of it somebody can draw it for you. We think that from this tam lights radiate out and invite Green Tara in space in front of us. It means we ourselves are Tara and now we also have Tara in front, Tara surrounded with the 21 aspects. So there is Tara and the 21 aspects and there are also all the buddhas and bodhisattvas, the yidams, dharma protectors, all the deities that we have in the refuge tree, they are there surrounding Tara with the 21 aspects, who are the central figures. We think that now we are Tara, and we have Tara in front, throughout, up until the mantra it remains like that, you stay as Tara and Tara is in front as well. Throughout all the offerings and the praises you have the self and front visualisations. You make offerings and praises. Again it says that the main point in this practice is to recite the 21 praises, and we praise all the different aspects of Tara. For the first praises, like I said before, the right hand of Tara is outstretched on her right knee, this is mainly thinking of the front visualisation. We are mainly focusing on the front visualisation. The right hand is outstretched on the right knee in the mudra of Supreme Giving of Bestowal of Accomplishments. Then for the first time we recite the praises. Just being aware of Tara in front, visualising Tara in front with that mudra, visualising all the surrounding, if we can be aware of the presence of Tara like that. Then again, after we have recited the praises we make the eight offerings and the mandala offering. We feel that all of that is presented to Tara in front. All these eight offerings that were mentioned before, we imagine they are all offered to Tara and buddhas and bodhisattvas. The mandala offering of the whole universe is offered to Tara. Then again we recite the praises, and now we think that the right hand of Tara is turned around facing downward. In a way it is placed above us, the mudra of giving refuge or protection. While we recite the praises we really feel we are getting this protection from fear and then we recite the praises two times. After the praises we repeat the eight offerings, we imagine they are presented to Tara, to 21 aspects, and to buddhas and bodhisattvas in front; and also the mandala, the whole universe, is again offered. Then we do the praises for the third time, this is where we would normally do it seven times. This is the last time round it comes in the text. And here there is a little extra verse that we recite. We visualise that from Tara in front of us – and we can also think if we want of all the 21 aspects of Tara – flows nectar through the crown of our heads and fills us up completely, so we receive all the blessings of Tara. We imagine a stream of amrita entering us through the crown of our head, fills the bodies of oneself, and we can also think of others that need protection, we can think next to us are the beings, we think it also enters their body, and it fills us up with a blessing, so it fills us with joy, with wisdom, compassion, fearlessness. We feel very warm, very pleasant feeling, blissful. We should try and imagine that, as we are reciting the prayers. Try to have the feeling of being filled up with all those qualities, every single aspect we can think of that we want to develop through the Tara practice is entering us at that time. If we would have done it complete, we would have done the praises two times, three times and then seven times. Like that, or one, two and three times. After that you are actually reciting a continuation of the praises, which is called the Benefits of Tara. It comes at the end of the praises, and you recite a short prayer here, which says: “Jet-sun pa-ma drol-ma che chen-no jig-dang dug-nal kun-le chap-tu sol.” It’s a supplication to Tara saying: “Tara please take care of us, think of us, take care of us, protect us from all fear and suffering.” So it’s a supplication. And then reciting after that the benefits of the practice, which is saying: whatever we wish for, may it be accomplished. May we accomplish fearlessness, may all our negativities be pacified, overcome all difficulties very swiftly, may we accomplish everything that we wish for, such as wealth or – it says if we want a son, then we get a son, if we want a daughter we get a daughter, if we want students we get students, if we want wealth, we get wealth. The idea is that whatever we wish for, may it be swiftly accomplished and may all obstacles be overcome and defeated. Then in the text after that there is a torma offering. In the daily practice you could leave out the torma offering or if you have the torma you can offer torma, or you can also offer something like have a plate of cakes and little sweets that could represent the torma. Some people who do that and they are not familiar with the torma making, they have a little plate with sweets, and if they do it every day, daily, they add a little bit, they add something to the plate. I saw Lama Lodro in Birmingham, he has it like that, so you don’t have to spend the time on the torma making. If people are working and you don’t have a lot of time. In the monastery you would do it with a proper torma, but it is possible to do it without torma, then you offer something symbolic instead. The torma represents in a way the destruction of all our negativities: belief in a self, habitual patterns, selfishness. The fact of offering this is like overcoming that, it is a representation of overcoming selfishness, self-cherishing negativities, and it’s offered again to Tara and the whole retinue in front. That’s followed by prayers for fulfilment of wishes. It’s often like that: you make an offering and then after that you request for the things that you would like to happen, such as long life, good health, accomplishment, wisdom, knowledge, all the qualities etc. Then it is followed by praise to Tara reminding us of the qualities of Tara. There are more offerings as well and then wishing prayers. When we talk about these practices, if we look at our own meditation, whatever we do, all of it has to do with accumulation of merit and purification of negativities. All the wishing prayers, when we do recitation, are connected with accumulation of merit and purification. So it’s not just like as if we were requesting somebody something, give us something, we are trying to put ourselves in the right frame of mind, to remember what is really beneficial, to try and focus what is really beneficial to focus on. At the end of the wishing prayers you have a short part for the mantra recitation. What happens for the mantra recitation is that all of the front visualisation, Tara that has up until now been in front and surrounded by the 21 aspects and with all the buddhas and bodhisattvas, now Tara dissolves into light and merges into yourself as Tara. You are still Tara, but now the front Tara merges into you, just before the mantra recitation. Again with that you feel that all of the compassion and realisation and activity of body, speech and mind of Tara and the 21 aspects, they become part of yourself as Tara. We were already Tara, but we are becoming enriched, through this we are becoming even more Tara, even more full of qualities, even more convinced that we are full of qualities. We are inseparable from Tara. Then we recite the Tara mantra: om tare tuttare ture soha. While you recite the mantra there are a few different ways of meditating. During the mantra recitation it’s recommended that you can try and visualise or be very clear about identifying with Tara. Like an appearance of a rainbow but without substantiality, we feel sort of made of light, we feel that we are Tara. We can try and focus on that, focus very clearly on oneself as being Tara in this light form, is one way. Then you can also think of the syllable tam in your heart: light radiates from this tam, it radiates out in all directions, it radiates outwards and upwards and you think it radiates out to all the Pure Realms and makes offerings to all the buddhas and bodhisattvas. It’s not that you have to visualise them there, you just think all those pure realms are always there. Limitless offerings radiate out. In fact it says: “From the tips of the light rays offerings are emanated.” Whatever one can think of, offerings to all buddhas of the three times are made. And then the light returns charged with all their blessings. It merges into us and we receive the blessings of all the buddhas. And we also imagine that this light from our heart radiates out to all the beings in the six realms. In a way with the buddhas we think it radiates upwards and now with the six realms it radiates down and out to all the six realms, to all the beings there. We feel that it reaches them and protects them from all their fears and suffering, as it gets into contact with all the beings in god realms, jealous god realm, human realm, animal realm, hungry ghost and hell realms. It relieves all their suffering and it establishes them on the spiritual path and makes a connection for them, frees them from suffering and fear. We can also simply listen to the sound of the mantra, rest our attention clearly on the sound of the mantra, or we can think of the meaning of the mantra, concentrate on the mantra itself. The mantra itself, if you translate it means something like “The Swift One”, which is Tara’s name relating to Tara’s activity. Tuttare means “protecting from fear”, a quality of Tara, and ture relates to accomplishing our wishes in the dharma, meaning accomplishing our spiritual practice and eliminating all the negativities and also achieving all the good qualities to help others. So you can choose between these different ways of focusing while you recite the mantra. This is all the development stage, the kyerim, and at the end you have the dzogrim, the completion phase. After the mantra first you recite the hundred-syllable mantra three times to purify any mistakes, and there is a short prayer to purify any mistakes in our visualisation or meditation. And then there is a dissolution of oneself as Tara. So you think that you yourself as Tara, you dissolve first into the tam in the heart, and then the tam dissolves into voidness, and then you rest for few moments in that state of clarity and no thought. That’s what we call the dzogrim. Then after that you have dedication prayers, so we are dedicating the merit to all beings and there are different end prayers, long life prayers to the lineage etc., dedication. That was really like a very brief instruction in the Tara practice, quite few of you were unfamiliar with the Tara practice, so if you go to the puja, you have a sense of what you are meant to focus on. It is really a combination of offerings and praises. You think you are Tara and Tara is in front, and you are presenting all these offerings and praises to Tara. You focus during the praises on the amrita etc. Do you have the questions at the end? Actually somebody asked about the eight fears. Generally they are classified as eight fears and they are represented by eight animals, so I said that I would let you know what the meaning is. It says Tara protects from the fear of elephants. These are animals that would have been in India at the time, when this was practiced in India. So it says Tara frees beings from the danger of elephants and this actually is interpreted as it frees us from ignorance. Elephant is representing ignorance. The elephants are quite dangerous at certain times of the year, they rampage and attack just about anybody who gets in their way. The next one is the fear of lions. The lion represents here pride, overcoming pride. The next is a poisonous snake, and that represents jealousy. Then it talks about water, literally it says: “The water of the rivers”, and this is interpreted as meaning attachment, both physical and mental aspects of attachment.” So the water of the rivers refers to attachment, grasping. The next one is the fear of fire, and that represents the fire of anger and hatred. Then it is mentioned the fear of ghosts. The ghosts here is interpreted as meaning doubt. The ghost of doubts, having doubts and confusion. There is a fear of iron chains, which represents the grasping desire. Grasping, more intense than the attachment. And the last one is the fear of thieves. Erroneous philosophies are the thieves. It is similar to wrong views. These are the eight fears that are mentioned. Do you have questions? Q: Can you explain the visualisation while you are reciting the mantra? L.Z. : Yes, the first one was just be aware of yourself as Green Tara. Just visualise yourself as Green Tara but in a form like light, appearance and emptiness, very clearly and having all the form and clear representation, but not solid. Identifying. You really have a sense that you are Tara. The second one is the lights going out. This covers both the lights radiating out to all the Buddhas with offerings, and lights radiating out to all beings, purifying all their negativities and suffering. That’s like one, you can do first the offerings to the buddhas and the all beings, if you like, but this is actually very common, you come across this in many of the visualisations, this thing of making offerings and purifying suffering. The third one is that you are aware of the literal meaning of the mantra or else you can focus on the sound of the mantra. If you are reciting it loudly just resting your mind on the sound of the mantra or concentrating on what it means, as you recite it. Q: Does the mantra rotate? L.Z. : No. It’s not even mentioned, you don’t visualise it, you visualise the tam. Q: Is the light green? L.Z. : Yes. Green represents swift activity and it is the idea that green is made of many other colours, everything comes together in creating this green colour, everything is accomplished to green. It is symbolising swift activity. Q: In the offerings it says …shapta tratitsa… What is tratitsa? L.Z. : It means “please accept”. Tratitsa soha, soha means “so be it”. Please accept all these offerings. Benza, when there is “benza”, it means it becomes a pure offering, not just an ordinary offering but a very pure indestructible sublime offering. You say. “Om aria tara saparivara…” Aria tara is a name of Tara, and saparivara means: along with your entourage, so it means Tara along with all the other aspects. Q: You said that the light going out is green? L.Z. : Yes, often when it says green, it may have a tinge of the other colours, too, but it’s mainly green. L.Z. : The music is also just an offering, really. You can simply imagine it as an offering of music. Each puja has a tradition how to play the music etc. In the Tara puja everybody can play the bell. Sometimes only one person plays the bell and damaru, sometimes you play bell alone, sometimes you play bell and damaru, so with the Tara it’s just the bell and you hold the dorje. It represents skilful means and wisdom in itself, the bell and dorje, but you are offering music. Q: Could you tell something more about the dissolution? L.Z. : In the dissolution you imagine that you yourself… up until now during the mantra recitation you are imagining yourself as Tara with the tam in the heart. Now you imagine that you dissolve, and you normally imagine, when a deity is dissolved you dissolve simultaneously from the top downwards and the bottom upwards, into the syllable. Now you think you have the tam. Then the tam dissolves from the bottom up. Just from the bottom up until the nada is left like a little thread and then that dissolves. Then you rest in that state. It’s like everything becomes finer and finer, till there is just that little thread left. Then you dissolve that and rest in the state of clarity, voidness. The idea is, we try to rest in a state with no sense of “I”, but still being clear. It’s not a sleepy or dull state, but clear state being very present, not having a lot of mental activity. In a way we are training also in that. You can see it as a training, even if we feel that maybe we don’t have that clearly there, we still try and you are experimenting. When you are doing the practice on your own, you can spend a bit more time on the dissolution. It’s always different to do the practice by yourself or to do it in a puja together with many people. In that puja normally there is not a lot of emphasis on the dissolution, ‘cause you can’t really do that as a group together very much. In the puja you go quite quickly over, but on your own you can spend more time on that. L.Z. : It depends when you are doing it. If you are not sitting down and meditating, you might not be able to visualise very much, you can just have a sense of the presence of Tara. If you are actually sitting and doing it, then you can do the same visualisation: think you are Tara and Tara is above or in front. Q: Is the nectar also green? L.Z. : No, I think the nectar is clear or white. It doesn’t really give a colour [in the commentary], but you wouldn’t think of it as green, maybe similar to that of Dorje Sempa. Q: What is the meaning of the mantra? L.Z. : Om tare tuttare ture soha. The om itself represents the body, speech and mind qualities of all the buddhas. Just by the sound om. And tare is translated as the Swift One, tuttare means protecting us from all fear, and ture represents fulfilment of our spiritual path. And that really represents the idea that we want to purify whatever needs to be purified and we want to accumulate whatever needs to be accumulated. Meaning we want to purify all our negativities and we want to develop all of the positive qualities. And soha just means so be it, may it be like that. Q: Would you recite the mantra out loudly or softly? L.Z. : Softly, not very loud but softly, to yourself. We will dedicate the merit.